Jordan Greenway found the opportune time to snap out of his scoring funk. The sophomore forward on the No. 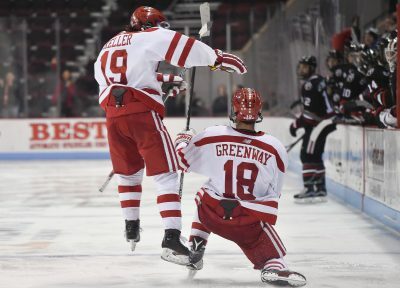 8 Boston University men’s hockey team – who had two goals in the 13 games prior to Friday night – ripped top corner on goaltender Ryan Ruck 3:11 into overtime, handing his squad a 3-2 victory over Northeastern University. The Terriers overcame a 2-0 hole, granting themselves a one-game lead in their best-of-three quarterfinal series in the Hockey East Tournament. Fresh off a 13-day break in between games, the Terriers took nearly the entire first period to dust off the cobwebs. Northeastern (18-14-5) forwards Zach Aston-Reese and Dylan Sikura – two of the nation’s top-five scorers – found ways past freshman netminder Jake Oettinger. The former banked a shot in 7:23 into the contest, while the latter brushed home a backdoor feed from defenseman Jeremy Davies 2:29 later. Facing a 2-0 deficit, matters got worse for BU when sophomore forward Bobo Carpenter left the game after a hit into the boards from Aston-Reese. Carpenter did not return to the game, and Quinn had no injury update postgame. Come the second frame, however, BU found life. Quinn’s side outshot the Huskies, 14-8, and found a breakthrough at the 7:33 mark. Freshman defenseman Dante Fabbro rifled home a wrister while on the power play, making it a 2-1 game. The Terriers piled pressure onto Ruck in the second frame, and he finished with 32 saves. In the third stanza – a frame in which the Terriers outscored opponents, 46-27, before Friday’s tilt – BU went searching for an equalizer. That omen paid dividends in the third period, as junior forward Chase Phelps erased Northeastern’s feverous start. The Minnesota native buried a feed from freshman forward Patrick Curry between Ruck’s five-hole. With the score knotted at 2-2, the Huskies and Terriers traded blows like a pair of welterweight boxers, but a game-winning tally was fleeting. 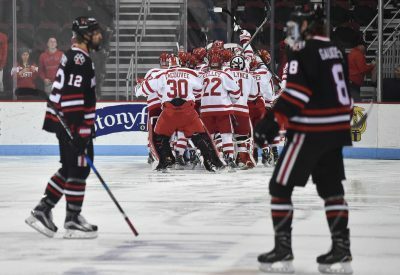 As overtime rolled around, the Terriers were handed a lifeline when defenseman Jeremy Davies was called for hooking freshman forward Clayton Keller. 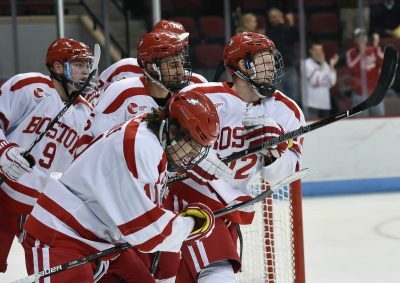 BU wasted little time in scoring the decisive tally on the ensuing power play, as sophomore defenseman Charlie McAvoy whipped the puck towards Keller at the blue line. The Arizona Coyotes draft pick found Greenway streaking far side, who then picked out the top corner. With the opening game decided, the Terriers and Huskies will again face off on Saturday night in game two of the quarterfinal series. Should BU snag another win, it’ll advance to the semifinal round of the Hockey East Tournament next weekend at TD Garden. Conversely, if Northeastern wins, the squads will play a decisive game on Sunday to determine the series. Either way, Fabbro said BU’s attitude is unwavering.